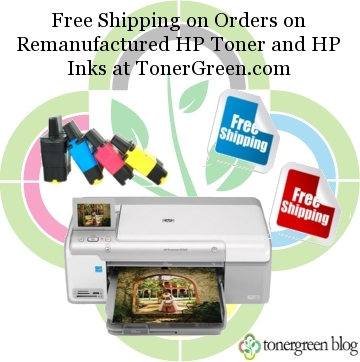 Free Shipping on Orders on Remanufactured HP Toner and HP Inks at TonerGreen.com | TonerGreen - Eco-Friendly Toners from the U.S.
Hewlett Packard is an iconic printer brand name, an unavoidable brand of printer that is hard not to be acquainted too especially for those who are looking for a personal printer to use at home. More popularly known as HP, this printer manufacturing company headquartered in Palo Alto, California, providing consumers not only with printers but also with laptops, computers, software, solutions and services. Their market targets both home users and office users in small-to-medium sized businesses up to large enterprises. In fact, HP changed the printing market when they released the world's first desktop printer to the market, the LaserJet Printer. Furthermore, using their cutting-edge technology and advanced equipment, Hewlett Packard was able to produce an extensive line of printers both inkjet printers and laser printers such as Business Inkjet Series, Color Inkjet CP Series, DesignJet Series, DeskJet Series, LaserJet Series, OfficeJet Series and PhotoSmart Series. Built with the latest and advanced features including energy-saving features, auto-duplexing, web-printing and mobile printing functions, Wi-Fi network support and other unique functionality, HP printers are in-demand in the market. There's no wonder you can find these printers at offices and homes. And if you're one of those who own an HP printer then you probably know that these printers just like your personal computers are needed to be maintained. One on-going cost that these HP printers have is buying replacement cartridges every time it runs out of ink and toner; there are HP toner cartridges for laser-based type of HP printers, and HP inkjet cartridges for those HP inkjet printers. That's why at TonerGreen, your environment-conscious supplier of value-added eco-friendly printer consumables, offers a wide selection of remanufactured HP toner cartridges and HP inkjet cartridges that covers almost all HP printers. The best part is when you order your HP inkjet or toner cartridges online at TonerGreen.com and your purchased amount reached $50 and above, we will give you the advantage of free-shipping without any coupon codes required. How amazing is that? At TonerGreen.com, we don't only provide printer users with eco-friendly high-quality printer cartridges for their printers, we also help you and other people to make environmentally responsible printing solutions.